Everyone loves Christmas with all its festive cheer and gift-giving. However, the cold of winter that accompanies the holiday is usually met with far less enthusiasm. Getting through the cold winter months takes a great deal of preparation, not to mention lots of clothing layers whenever one ventures outdoors. Such reasons are why people are so happy when spring rolls around and the natural landscape once again bursts with new life. Another benefit of the spring season is that many outdoor activities that were hard, or even impossible, to do during winter can now be enjoyed as the temperature rises. 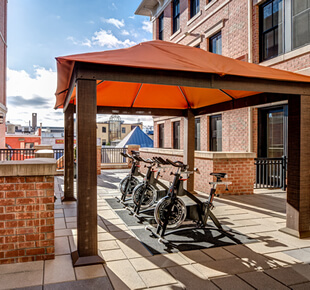 Those living at The Avenue at South Orange, New Jersey, are thrilled that a lot of fun outdoor activities can be found close at hand to the luxury apartment complex. One reason why residents of The Avenue at South Orange look forward to spring is that the community garden opens up once again. The South Orange Community Garden is a recreational, organic community garden where interested residents can purchase a permit to use one of the garden’s plots. The community garden opens up in late March and operates from either 8am to 8pm or dawn to dusk. (2) Those who don’t wish to garden a plot can still enjoy the sights and fragrances of the community garden itself. A popular locale for outdoor spring activities is the South Mountain Reservation. The Reservation is a nature reserve that covers 2,110 acres and features hiking trails, a Girl Scout camp, fishing spots, carriage roads for jogging or horseback riding, a wildlife refuge, and picnic areas. (3) Spring Mountain Reservation also boasts a dog park that is split into two sections: a 1.3 acre lot for big dogs and a 0.7 acre lot for small dogs. Also featured is the Wildflower Sculpture Park that showcases four distinct sculptures located within the beautiful confines of the Wildflower Preserve.